Grand Dizzy was feeling very down one day, so Dizzy and Daisy decided to cheer him up by baking him his favourite food, cherry pie! So off went Daisy to get some cherries from her cupboard and there was none to be seen! “Pogie’s pinched the cherries!” she cried, as she saw Pogie’s pawprint in the cupboard, “That darned Fluffle. Come here you!” and Pogie promptly darted of into the enchanted forest to escape Daisy’s rage. Dizzy and Daisy decided to go into the forest to catch Pogie and gather some more cherries at the same time. Whilst searching for Pogie they got lost and found a castle, where they thought they would find help, but it seemed deserted. They looked in the castle for Pogie, but Daisy caught herself on a mystic spinning wheel. She started feeling really sleepy, so she found a bed and went to sleep. “Wake up Daisy, wake up!” shouted Dizzy. But before he could wake her up, Rockwart the Troll caught him and locked him up underground! Escape from cave, the easy bit ! Get pickaxe from by troll. Get cage from by lion. Go down avoiding the bat then use pickaxe to break into cave. Down, give gold to ferryman. Dropcage by fluffle up, up, stand on edge of ledge and jump onto clouds and into the castle. Get harp, jump across clouds to heaven and give harp to St.Peter. Go back to fluffle, drop cheese in cage, pick up cage and take back to troll, drop cage, go into castle go up, up, get key, down get motor. Back to ferryman give him motor, get scythe, go up trees and jump into castle again. Use scythe on thorns, get bugle, up, unlock door with key, go across the top and get the tweezers. Jump off edge then go back to lion and use tweezers, get thorn and go back to castle, go to doppelganger room, drop thorn and make doppelganger walk across thorn and die. Get spanner and go left until you reach the bloke. Give him the bugle and go left to where the troll used to be. Go across upper bit and use spanner on drawbridge, go over drawbridge, see princess and get flag. Go back across upper bit. Go up, put flag on flagpole. Go all the way back to daisy kiss her. The biggest hero of them all returns for high adventure, rich rewards and big trouble! 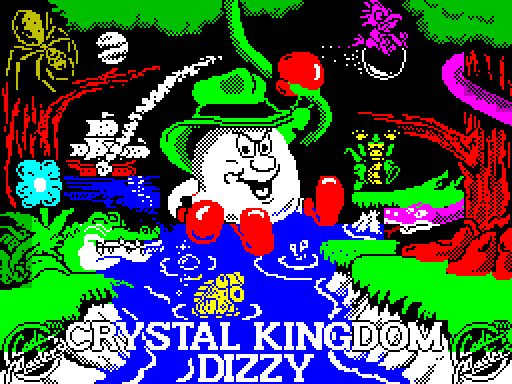 Join superstar Dizzy in his most exciting adventure yet! Four complete worlds of magic and mystery await! 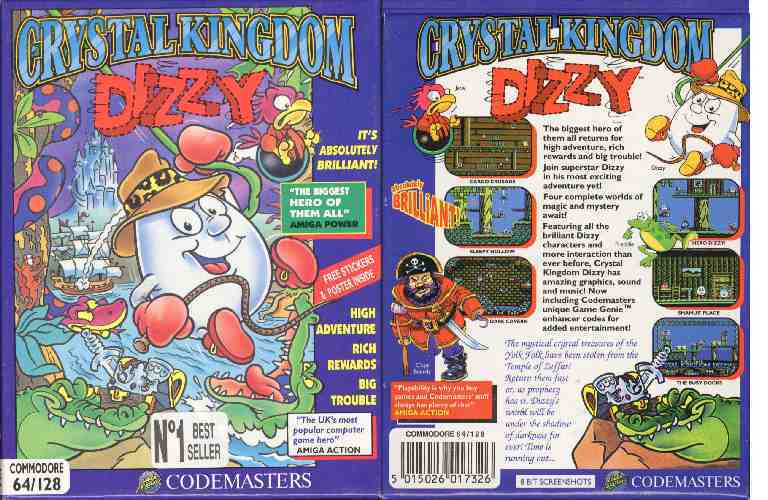 Featuring all the brilliant Dizzy characters and more interaction than ever before, Crystal Kingdom Dizzy has amazing graphics, sounds and music! 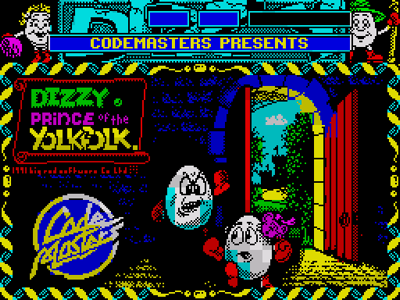 The mystical crystal treasures of the Yolkfolk have been stolen from the Temple of Zeffar! 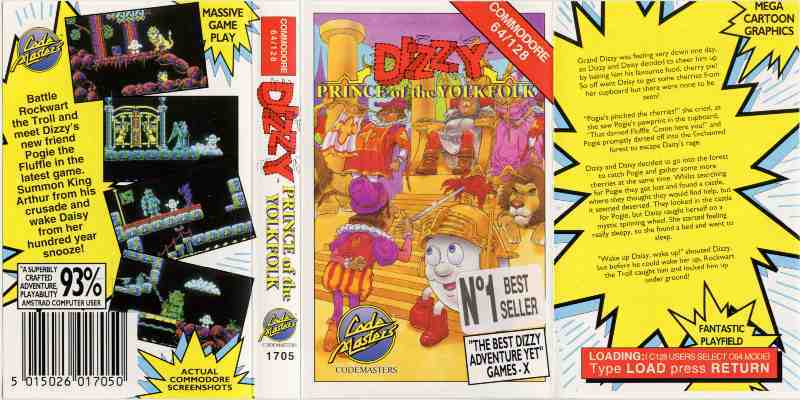 Return them fast or, as prophecy has it, Dizzy’s world will be under the shadow of darkness for ever! L, GET WEIGHT, Rx4, GET WEIGHT, Lx2, DROP WEIGHT ON LIFT CONTROL PLATFORM, ENTER WINDOW, GET WHIP, L, U, L, DROP WEIGHT ON LIFT CONTROL PLATFORM, R, U, JUMP RIGHT ONTO PLATFORM, U, L, STAND ON EDGE OF PLATFORM, DROP WHIP, L, ENTER HOUSE, TALK TO DYLAN, GET NEWSPAPER, L, D, JUMP LEFT, L, ON CLOUDS, D, GET HEART, UP-LEFT, GET SCREWDRIVER, R, D, Rx3, U, L, ENTER HOUSE, TALK TO DENZIL, GET SPANNER, TALK TO DENZIL, GET GLASSES, L, Rx2, D, R, ENTER HOUSE, USE SPANNER ON GENERATOR, Lx3, U, R, ENTER HOUSE, TALK TO DORA, GET CAKE, L, D, TALK TO CJ, GET UMBRELLA, L, DROP NEWSPAPER, Lx5, GET DIAMOND, UP-RIGHT, L, DOWN-RIGHT, Rx2, USE DIAMOND ON WELL, TALK TO GENIE, Rx2, GET NEWSPAPER, U, ENTER HOUSE, TALK TO GRAND DIZZY. R, GET FISH FOOD, R, DROP FISH FOOD NEAR EDGE, R, TALK TO CAPTAIN, R, U, GET TAPE, D, R, Ux3, GET BLU-TAC, Dx4, R, DROP BLU- TAC, L, U, R, L, GET WHEEL, D, R, GET SAW, Lx2, D, R, DROP WHEEL, DOWN-LEFT, Lx2, GET PLANK, DOWN-RIGHT, D, DROP PLANK BY DRIP, GET HEART, DOWN-RIGHT, L, DOWN-RIGHT, GET NEEDLE AND THREAD, L, U, L, UP- RIGHT, GET PATCH, L, DOWN-RIGHT, UP-RIGHT, L, DOWN-RIGHT, GET SCISSORS, R, UP-LEFT, Ux3, DROP SCISSORS ON HORIZONTAL POLE, D, U, DROP PATCH BY HOLE, Dx3, R, GET WHEEL, GET BLU-TAC, L, U, Lx2, DROP WHEEL ON POST, Lx3, TALK TO DOZY, GET FLAG, Rx5, Ux3, DROP FLAG BY POST, Dx3, Lx2, TALK TO CAPTAIN, GET BADGE, Lx2, SWAP BADGE FOR MAP & TELESCOPE, Rx2, TALK TO CAPTAIN, Rx2, Ux3, STAND ON CROWS NEST, DROP TELESCOPE. U, R, D, R, UP-LEFT, U, GET CRYSTAL, D, R, DOWN-LEFT, U, L, D, TALK TO MAN, GET CHALICE, CROWN AND SWORD, Rx3, DROP CHALICE, CROWN AND SWORD ON WHITE PART OF CATAPULT, R, GET SALT POT, U, R, D, R, GET PARACHUTE, L, U, D, U, U, DROP SALT POT ON BLUE BOX, GET CROWN, D, L, U, GET BLOCK OF ICE, DROP CROWN, Rx2, GET SWORD, DROP PARACHUTE, D, D, L, U, L, D, L, DROP ICE ON SMALL LEDGE, GET CHALICE, R, Ux2, GET CROWN, L, DROP CROWN IN MIDDLE SPACE, DROP SWORD IN RIGHT SPACE, DROP CHALICE IN LEFT SPACE, TALK TO MAN….Done it!! Here’s the story in a nutshell: our hero, Guybrush Threepwood, set out to be a pirate, despite his physical build and unfortunate name; along the way, he fell for the lovely Governor Elaine Marley, who by this time has finally come to love Guybrush (for some unexplained reasons). The ghost pirate LeChuck also loves Elaine and is continually trying to make her his undead bride. 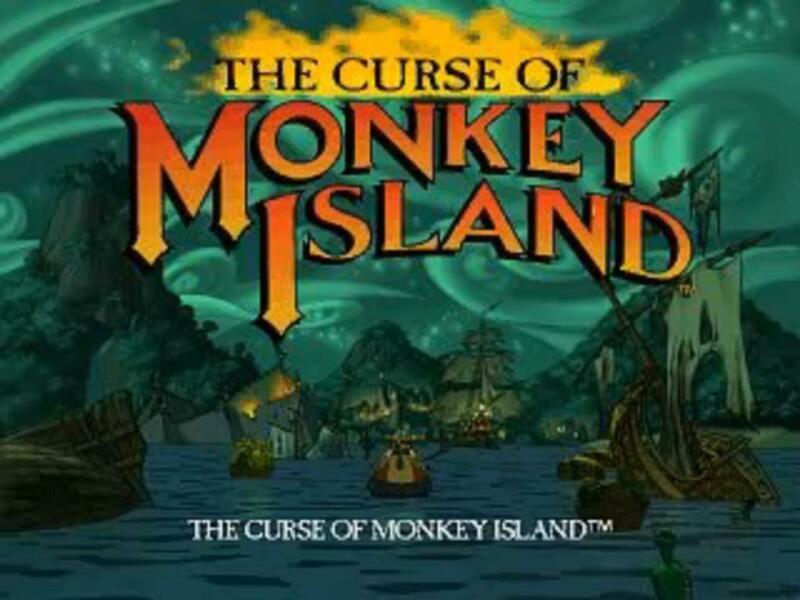 Naturally, this has led to some problems for Guybrush–although he has “killed” LeChuck a couple of times, his enemy continues to molest him and seek Elaine’s hand in marriage. There is some lack of continuity between the second game and this one, but it is inconsequential. As this game begins, Guybrush finds LeChuck besieging the fortress of Elaine and manages, in his usually inept yet successful way, in thwarting LeChuck’s plans. Elaine finally consents to marry him, but unfortunately the ring Guybrush puts on her finger is a cursed ring from LeChuck’s stash that turns Elaine into a solid gold statue. 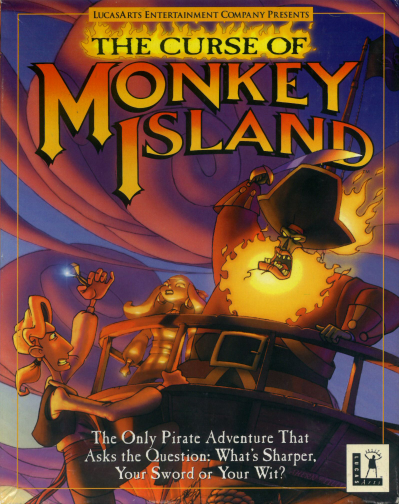 The game revolves around Guybrush’s mission to break the ring’s curse, thwart LeChuck’s evil plans, and somehow manage to stay alive. Along the way, much hilarity ensues.